Dubai, UAE, 24 May 2018: The Jaguar I-PACE eTROPHY racecar charged ahead as it made its global debut in Berlin. Founder and CEO of Formula E Alejandro Agag had the honour of marking this historical moment alongside Jaguar Racing as he drove the racecar around the iconic Tempelhof Circuit. Alejandro Agag, Founder and CEO of Formula E: “The eTROPHY car feels great – it looks like a production road vehicle with the performance of a racecar. This series is all about bringing new innovative technology to a wider audience, and the Jaguar I-PACE eTROPHY is a perfect platform to do this alongside Formula E.
The Jaguar I-PACE eTROPHY will be the official support series for the ABB FIA Formula E Championship in 2018/19. 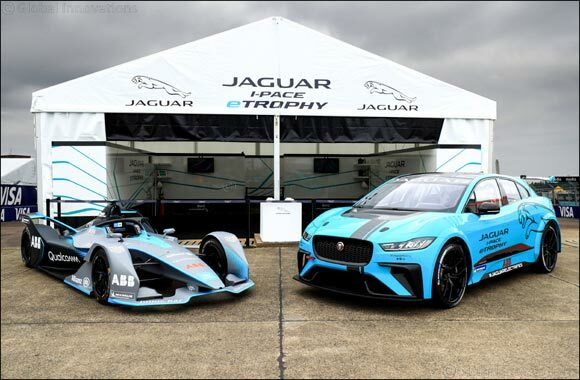 Up to 20 Jaguar I-PACE eTROPHY racecars will line up on the grid on the streets the centre of global cities such as Hong Kong, Rome, Paris and New York. The Jaguar I-PACE eTROPHY offers an ‘Arrive and Drive’ package for the drivers on the grid. All of the vehicles will be designed, engineered and built by Jaguar Land Rover Special Vehicle Operations (SVO). The package includes professional technical support from racecar preparation to data engineering, global logistics for vehicles, spare parts and equipment.